Are Hot Dogs Bad for Gout? If you have arthritis, you're well aware of the pain, inflammation and swelling it causes in your joints. Pain-reducing medication is the primary method of treating arthritis. In addition, making changes to your diet to avoid inflammatory foods in favor of foods that reduce inflammation may help ease your symptoms. In some people with arthritis, artificial sweeteners may be a culprit that requires avoiding. No reports exist of artificial sweeteners causing joint pain in healthy individuals. Because a diet rich in sugar can aggravate arthritis, experts often advise people who have this condition to reduce their sugar intake. This may lead you to consume foods with artificial sweeteners used as sugar substitutes. If you're sensitive to these substances, your immune system may react, triggering an inflammatory response, according to the Arthritis Foundation. The resulting inflammatory response may aggravate arthritis symptoms like joint pain and swelling. If you suspect artificial sweeteners are triggering pain in your joints, try eliminating them for a few weeks to see if your symptoms ease up. Read food labels carefully, because artificial sweeteners occur in many foods -- even in items that you may least expect. You're likely familiar with the brand names for the typical artificial sweeteners, but manufacturers often list them under a generic name on labels. 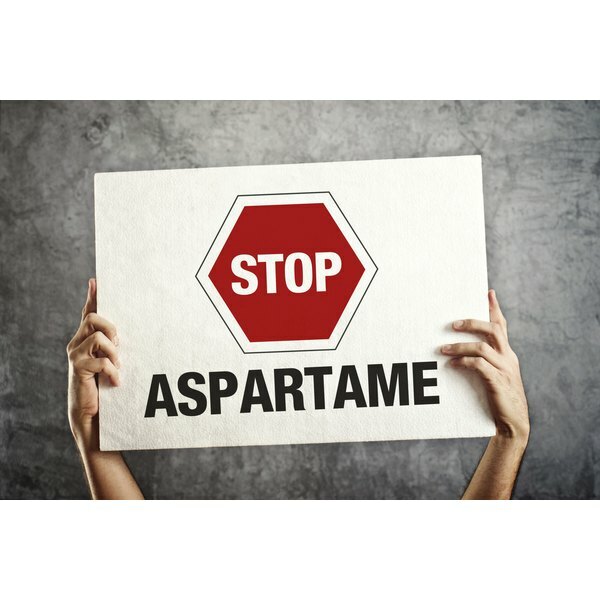 Saccharin, aspartame, acesulfame-K, also listed as ace-K, sucralose and neotame are common artificial sweeteners you may find in the ingredient list. People with arthritis should try to reduce their sugar intake. If you're sensitive to artificial sweeteners, try other alternatives. Stevia is a natural sweetener made from the stevia plant. It gets its sweetness from substances called steviol glycosides, contains zero calories and doesn't raise blood sugar. Yacon syrup is a low-calorie natural sweetener that comes from the yacon tuber. It doesn't raise blood sugar and may actually help manage weight. Researchers found daily yacon syrup consumption resulted in a significant decrease in weight and BMI, according to a study published in the April 2009 issue of the "Clinical Nutrition" journal. Certain foods may help reduce arthritis symptoms and improve joint health, according to the Arthritis Foundation. These are typically foods that help fight inflammation. Tart cherries contain a phytochemical called anthocyanin that may help ease arthritis symptoms. Fish oil also has anti-inflammatory properties, so incorporate fatty fish like mackerel and salmon into your meal plan a couple of times a week. Cruciferous vegetables such as broccoli, kale and Brussels sprouts are packed with phytochemicals and may also support joint health.